1.Team Web Power the operator of Automotivedirectory.in reserves the right to update the TOU at any time without any prior notice to you. 3. No User shall attempt to gain unauthorized access to any Services, other accounts, computer systems or networks connected to any Automotivedirectory.in server or to any of the Services, through hacking, password mining or any other means. 4. 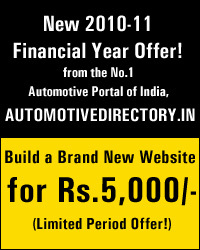 The features and services on the Automotivedirectory.in site is provided on an "as is" and "as available" basis, and we hereby expressly disclaims any and all warranty except warranty expressly stated herein, including but not limited to any warranties of condition, quality, durability, performance, accuracy, reliability, merchantability or fitness for a particular purpose. All such warranties, representations, conditions, undertakings and terms are hereby excluded. 5. You may not copy, reproduce, recompile, decompile, disassemble, reverse-engineer, distribute, publish, display, perform, modify, upload to create derivative works from, transmit, communicate or in any other way exploit any part of the information or material obtained through the Automotivedirectory.in website and/or the Website's material. 6.Team Web Power has no obligation to monitor the Communication Services (The Services may contain e-mail services, newsletter, tell your friend and/or other message or communication facilities designed to enable you to communicate with us or others). However, Team web power, the operator of Automotivedirectory.in reserves the right to review materials posted to the Communication Services and to remove any materials , contents in its sole discretion. Team Web Power reserves the right to terminate your access to any or all of the Communication Services at any time, without notice, for any reason whatsoever. 7. This Agreement shall be governed by the laws of the Chennai , INDIA Jurisdiction only without regard to its conflict of law provisions. 9. There is no exclusive partnership, joint venture, employee-employer or franchisor-franchisee relationship between Team Web Power and any user of the Service. 10.Team Web Power reserves the right at all times to disclose any information as Team Web Power the operator of Automotivedirectory.in deems necessary to satisfy any applicable law, regulation, legal process or governmental request, or to edit, refuse to post or to remove any information or materials, in whole or in part, in Team Web Power "s sole discretion. See the Privacy Statement disclosures relating to the collection and use of your information. 11. Links to Other Sites Automotivedirectory.in contains links to other web sites. Automotivedirectory.in has no control over, and accepts no liability, obligation, or responsibility for, the content or performance of other web sites. Any such links do not necessarily constitute an endorsement of or any representation regarding the linked web site, its content, its owner, its performance, or its owner's products or services. 12.Codes of Conduct As a user and/or member, you are subject to Automotivedirectory.in standards and other rules that may be published from time to time by Teamwebpower. Automotivedirectory.in currently provides selected free services to users who agree to abide by the terms and conditions of our standards. Free services are subject to change at any time without prior notification. 13.Online advertisements are accepted upon the representation from direct customer with the confident that the advertiser and its agency have the right to publish and display that content. In consideration of such on-line publication and display, the advertiser and its agency agree to indemnify and hold the on-line publisher harmless against any expense or loss by reason of any claims arising out of on-line publication and display. 14. kindly ensure that all the information provided by you in your registration or web mail are true, under any circumstance if it is found false Team Web Power reserves the right to terminate your account or remove the information without any prior notice to user. YOU EXPRESSLY AGREE THAT USE OF THE SITE IS AT YOUR SOLE RISK. NEITHER WE, NOR OUR AFFILIATES, NOR ANY OF OUR OFFICERS, DIRECTORS, OR EMPLOYEES, AGENTS, THIRD-PARTY CONTENT PROVIDERS ("PROVIDERS"), MANUFACTURERS (�MANUFACTURERS�), MERCHANTS ("MERCHANTS"), SPONSORS ("SPONSORS"), LICENSORS ("LICENSORS"), OR THE LIKE (COLLECTIVELY, "ASSOCIATES"), WARRANT THAT THE SITE WILL BE UNINTERRUPTED OR ERROR-FREE; NOR DO THEY MAKE ANY WARRANTY AS TO THE RESULTS THAT MAY BE OBTAINED FROM THE USE OF THE SITE, OR AS TO THE ACCURACY, RELIABILITY, OR CURRENCY OF ANY INFORMATION, CONTENT, SERVICE, OR MERCHANDISE PROVIDED THROUGH THE SITE.